We ask for any person to come forward who may have information about this case. We will respect your anonymity. All information will be sent immediately to Scott Dyleski's defense team, headed by attorneys Katherine Hallinan and Sara Zalkin. Please do not send tips to other websites about Scott as they are not officially endorsed by Scott's defense team nor family. 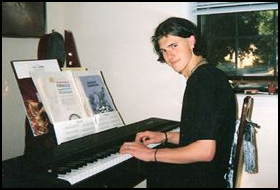 Scott Dyleski is a young man unjustly imprisoned in California for the murder of Pamela Vitale. Pamela Vitale was brutally murdered in her home in Lafayette, California on October 15, 2005. Scott was 16 at the time and lived in a planned community about a mile away in the same Hunsaker Canyon area of Lafayette. Scott was sentenced to Life Without Parole in September of 2006. He was transferred to San Quentin Prison on his 18th birthday, becoming the youngest inmate in the California prison system at that time. Scott was later moved to Kern Valley State Prison. Scott was convicted based on very flimsy evidence and lack of an adequate defense. He was assigned a relatively inexperienced Public Defender with limited resources who had to go up against an aggressive, experienced prosecutor with virtually unlimited resources in a case that received prejudicial coverage. However, his defense attorney did not even take advantage of the resources at her disposal nor question and follow-up testimony where she could have. At the least, both Scott Dyleski and Pamela Vitale deserve the justice of an intense investigation and a fair trial. Scott may be different from you and has his faults like all of us, but he is not a murderer. Scott Dyleski's claim has always been one of innocence. The Appellate Court had requested an Opposition Response from the CA Attorney General's Office. The AG filed a response on 2.28.2012. Petitioner reply was submitted on 3.22.2012 - the response to the Attorney General, amongst other claims, is that the AG response amounted to an informal and general denial that did not include evidence that the petition's allegations are factually unfounded. Teen Serving Life for Murder: Jack the Ripper or Framed? 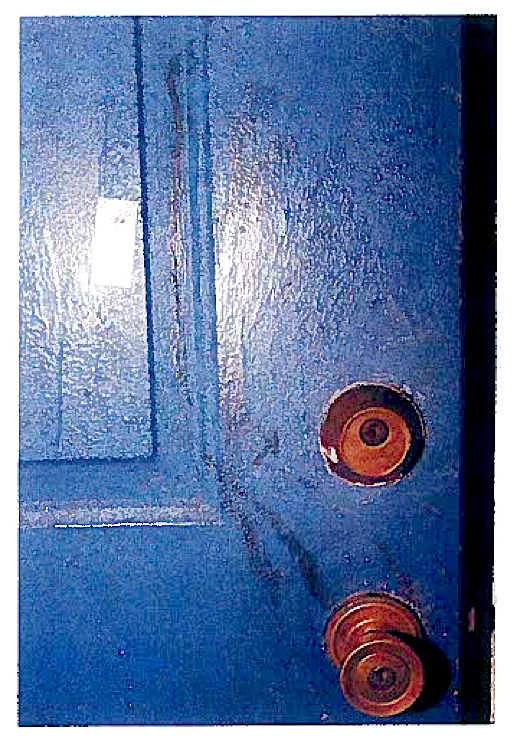 Defense experts recently examining evidence in the case purport that the murder of Pamela Vitale was personal, committed by someone who was comfortable in the Horowitz/Vitale trailer, who used a key to reenter the front door, and who cleaned-up and/or tampered with the crime scene. Below is a picture of the front door and blood around the deadbolt lock - the blood is in a circular swipe pattern similar to what would be made when using a key to unlock the deadbolt. There were many initial claims by investigators on the scene of a long shower being taken and that the perpetrator spent a long time in the trailer. The biggest bombshell in Dyleski's December, 2011 petition could be that the night of Pamela Vitale's murder, Daniel Horowitz claimed in his police interview that the only path he went through the house was limited to the living room - a path from the front door, around Vitale's body, around the coffee table and to the far side of the loveseat to use the land line. He claims he did not go anywhere else in the house. However, the petition reveals that law enforcement recorded conversations Horowitz was having on his cell phone that night. In one call he states, "the guy showered ... He only touched one knob." Horowitz would not know this even had he looked into the hall bathroom because the shower curtain was pulled to the left, completely concealing the shower faucet and knobs. Law enforcement officers interviewed Daniel Horowitz on the night of the murder and into the wee hours of the morning. They thought Vitale was murdered by someone who was not in any rush at the crime scene, who felt comfortable in the house, and who knew Horowitz's schedule. PO: But I mean, are you gone every Saturday? usually work Saturday mornings. I’m usually at home. That’s what we were just talking about. PO2: It didn’t appear to be any rush to leave. Horowitz said he did not usually work on Saturdays. He offered up names of his Polk legal team as having knowledge he would be gone that day. It seems Vitale also knew her attacker since her wounds were defensive in nature and that most or all of the weapons used came from within the house. Claims that Scott Dyleski used rocks, brought with him to the scene, remain unsubstantiated and are highly improbable. It is more probable that every weapon used came from inside the trailer or near. Vitale's eye glasses were undamaged, bloody, but carefully folded and found on top of the television set. Detective Barnes even reported "It appeared as though the glasses had been intentionally placed on top of the television as all other items appeared undisturbed with no visible blood." The large screen television had at least seven pieces of stereo and other equipment on top of it, two or three small speakers, and several DVD or CD tapes all undisturbed even though it had been moved about three feet to a position where it was firm against the wall, entirely blocking the bedroom doorway of the master bedroom when officers arrived. The master bedroom room is where the Vitale/Horowitz guns were kept. Who knew there were guns kept in the bedroom? This seemingly relevant question was never asked of Daniel Horowitz. 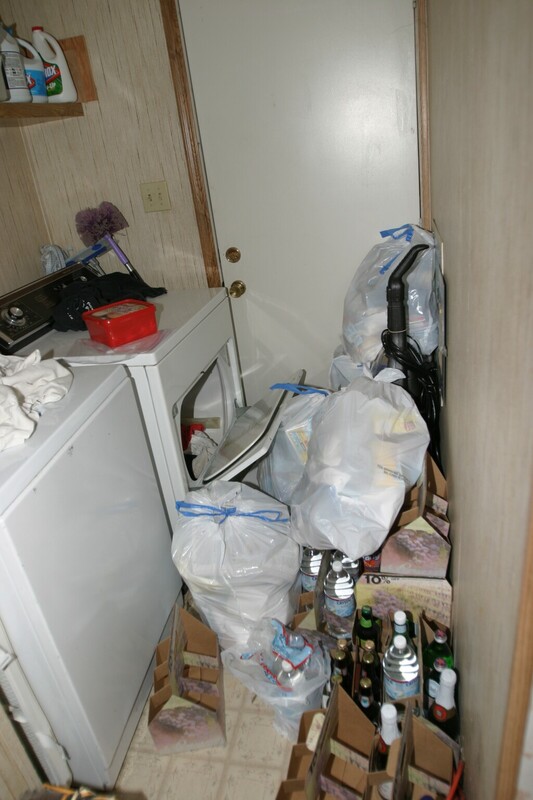 Vitale's maid had also detailed large wads of cash that were retrieved by Vitale from the bedroom (see below), yet Daniel Horowitz said they really did not keep cash in the house. Another person claimed Daniel had a large gold coin collection. Daniel Horowitz claimed nothing was missing from the trailer except possibly a pair of his jeans. There are bloody marks on the outside dead bolt that mimic the motion a hand would use to unlock the front door. It's probable someone used a house key during the commission of the murder and according to the defense expert medical examiner, was the possible weapon used to inscribe the mark on her back. 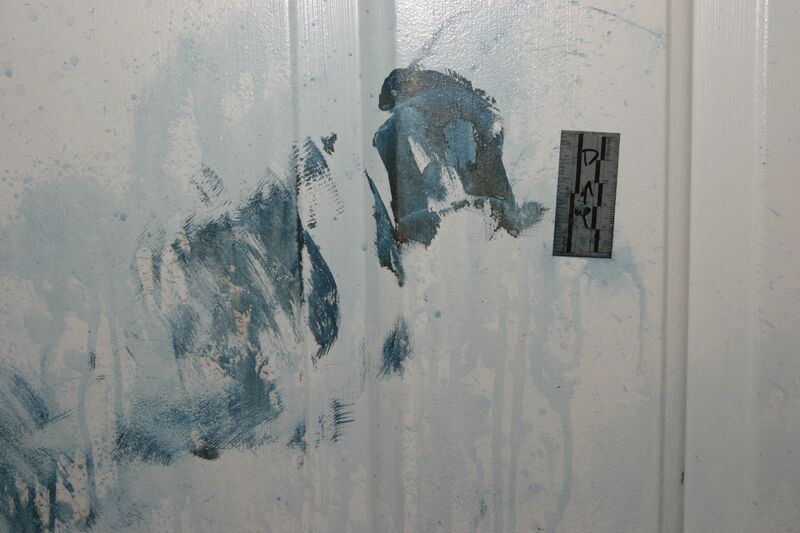 Marks on the inside of the door look as if someone was trying to turn the dead bolt, or to keep it locked. There are also clearly cuff prints from a sweatshirt overlayed on the arm print. Scott Dyleski did not own any sweatshirts. But it got little press. It was too late as Scott Dyleski was already presented as some evil, disturbed figure in the media. An image promoted by the prosecutor time and again (see habeas petition). While Hal Jewett tried to find anything of Scott Dyleski's to match to these marks, it is clear the mark looks like a capital letter "H" or if turned, a capital "I", not Dyleski's personal logo. Vitale was also stabbed, but after she was dead or near death. The entire crime scene appears as Overkill - a key red flag that someone close to the victim who was enraged is responsible for the crime. If it is not rage and overkill, then it was staged to look like something or the other or confuse the crime scene and taint it perhaps. The cleaning up is either a sign the perpetrator was very close to the victim and realized what they had done or, again, was done to cover other evidence or confuse the crime scene. During 911 call exclusion discussions (no jury present), Deputy DA Hal Jewett outlined elements of the crime scene indicating Daniel Horowitz looked guilty because he can be heard moving in and out of the house and that Horowitz was responsible for moving several items in the kitchen, those items had blood on them. One of those bloody items, a coffee cup had Horowitz's DNA on it. A bowl supposedly used for cereal that morning had blood on it and Horowitz claimed a box of cereal had been taken down. Shockingly, Hal Jewett even stated a piece of pottery had been removed, inferring Daniel Horowitz moved it or took it. The pottery piece was from an inscribed wedding vase. Daniel Horowitz had also claimed he only traversed a path from the front door, near Vitale's body, to a love seat many feet away to dial 911. However, during initial questioning he revealed information to law enforcement regarding crime scene evidence in the hall bathroom. Detectives found the shower curtain pulled to the left, hiding the faucet and handles from view, but Horowitz should not have known this nor should he even have known anything about that bathroom. Detectives walked out of the room during their interview with Horowitz. Daniel Horowitz is on the phone with ex San Francisco Police Officer Andrew Cohen. Daniel Horowitz claimed at one point that he briefly spoke to that 911 dispatcher, but he did not. That dispatch line was left open and recorded for 12 minutes. Horowitz actually did call dispatch two more times though saying he was trying to logic out the situation and that he was in a logical mode. Many elements of the crime scene looked staged, as if someone cleaned-up. This is in opposition to a crime committed by a stranger - especially as a burglary gone bad. The right kitchen sink was full of dirty dishes, perhaps from last night's dinner except on top is a bowl and spoon with some milk and what looks like oatmeal in it. Horowitz claimed he did not eat breakfast at home that morning, but that he always had oatmeal for breakfast. Vitale had boxed cereal for breakfast per Horowitz. Horowitz said the hot water did not work in the kitchen. No one had attempted to turn on the water in the kitchen sink. There were bloody items in the left sink curiously placed given the crime scene - two coffee cups apparently used that morning, one with a broken handle. That sink also had a sharp paring/steak knife and coffee grounds, some grounds are on top of the knife. There is a bloody water bottle that was obviously handled and/or moved on the counter. Scott Dyleski's DNA (blood, sweat, hair, saliva) was not found anywhere in the house nor his fingerprints. 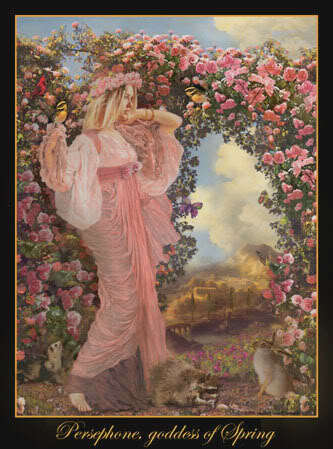 It appears there was a struggle at the back of the living where a small table was displaced six inches, yet only one of numerous framed pictures was NOT standing upright. A fairly large candle holder and a vase are also standing upright. In addition, major pieces of a large, inscribed vase were also found lying on a disarrayed stack of small boxes and papers within a foot or two of that displaced table. Vitale's blood is on these vase shards. Given there was not much or any blood in that area, it's likely that is where Vitale was originally attacked. Again this is in opposition to how the crime was portrayed at trial as a blitz attack at the front door and how Daniel Horowitz has portrayed it. The crime scene does not indicate that Vitale was brutally attacked first at the front door and subsequently at the back side of the living room. The only other implication of this this evidence seems to be that the crime scene was staged and possibly tidied. 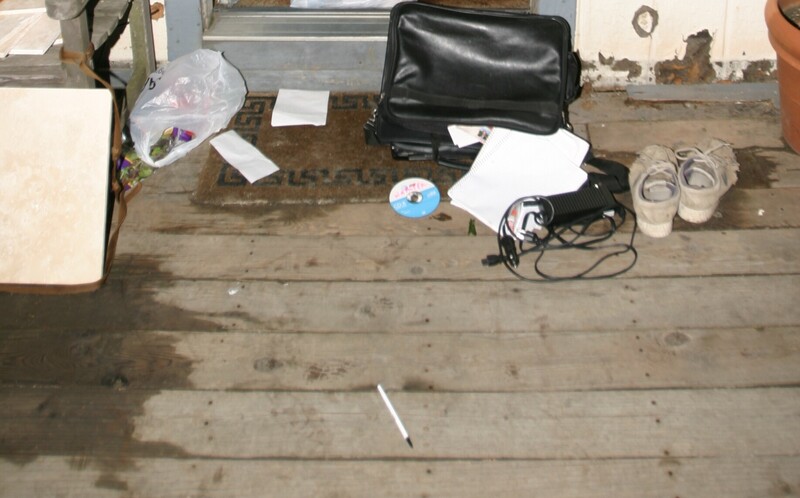 Evidence photos show that papers on the couch had been riffled through, papers that were mostly about Horowitz's legal cases although Vitale's purse was left untouched. There is a single, passive drop of blood on one piece of paper by the couch that criminalists noted to be of interest because it likely came from the perpetrator. Curiously there is also blood around the computer cord. When responding officers arrived, Daniel Horowitz almost immediately claims his wet shoulder and the large spot on outside the front door that is wet happened when he spilled a dog water bowl. No one asks him to recreate this incredulous claim of how his shoulder could have gotten wet in this manner. Having been a canine handler, Officer Hoffman says he was keenly aware there were no signs of dogs on the property. Later that night, Horowitz claims the dogs had escaped from their pen, but where were they? Horowitz claimed he made attempts to patch their fence, but recently they had escaped on a regular basis. Why would their water bowl be on the front porch anyway since they were kept penned quite a ways from the trailer due to Vitale's allergies? Horowitz claimed he kept special 'ranch clothes' in the plastic bin. This plastic bin, kept near the front door was overturned and broken. The clothes inside of it were bloodied although it is apparent from crime scene photos presented that there is no blood on the broken, bottom edges of the bin. While Daniel Horowitz said in trial testimony that no one lived on the property, there were, in fact, two men who lived on the main property. Mike McKeirnan lived in a barn very close to the Horowitz/Vitale front gate. He told police he did not hear any cars driving up the driveway, but did hear one driving down (although he did not awake until 10-11 am). He heard a car passing by, probably from the Schneider residence, at high speed between 4-6 pm. McKeirnan had also told the news media that the first officers at the scene thought the murder had occurred between 1-3 pm. Anthony Roderick had lived in a fifth wheel between the trailer and the mansion under construction for nearly a year. Horowitz and Vitale employed him to work on the mansion. Officers had a difficult time locating him the night of the murder and when they did he said he was too ill to talk to them. They finally interviewed Roderick after 3 pm the next day in San Lorenzo. Daniel Horowitz had already indicated to police that Roderick should not be a suspect. At trial no one mentioned the day laborers who were picked up at places like Home Depot, undocumented workers on the property, or any workers who were not interviewed or located by police investigators. At least three other men lived on the property that Vitale and Horowitz recently purchased from Joe Lynch. Scent dogs tracked over to two dwellings inhabited by Fred Blodgett and Gerald "Gerry" Wheeler. Additionally, a cadaver dog alerted at Gerry Wheeler's. The scent did not go any further than these houses. Claims were that Fred Blodgett was out of state at the time. Wheeler's house had clothes soaking in a plastic bin in red tinted liquid. Gerry Wheeler was very nervous when interviewed and initially flunked a truth telling test. He was still considered a suspect when Scott Dyleski was arrested. Daniel Horowitz provides disparate accounts of his whereabouts the day Vitale was murdered in police reports, interviews, and on television. Robert Massi, a Las Vegas lawyer, claimed in the media that he was with Horowitz from 8-10 am that morning. JOHN GIBSON, HOST: A friend of Daniel Horowitz says the defense lawyer feared for his own life. Horowitz has defended criminals ranging from drug dealers to murders. However, police investigators recorded the conversations Horowitz had while being interviewed the night of Vitale's murder"
"During a phone conversation, Mr. Horowitz told the other party that he "met Bob Massi at 08:15, after shopping at Safeway. And, then I left there probably...sometime around 9:00 (Exhibit B)." Vitale's sister and brother in law, the Hills, were concerned from the beginning that Horowitz was manufacturing suspects, and manipulating the media. He told them "This is a big story!" Police investigators also wanted to know if it was Horowitz who was initiating media contact. Although Robert Massi was to be one of Daniel Horowitz's alibi witnesses within a few days he is not only his witness, but his lawyer. "Horowitz's lawyer, Robert Massi, said in published reports Horowitz is not a suspect and has an alibi for his whereabouts in the hours before his wife was found (Oct 18, 2005, ABC News)." There was never any other validation that Horowitz and Massi were at Millies or when. Investigators did not verify Horowitz's alibi with Massi until after Dyleski was arrested (Oct 20, 2005, SF Chronicle) . However, this may not be nefarious or poor police work, perhaps they did not think the murder occurred during that time period, but in the afternoon since there are other indications of this. The facts are that Daniel Horowitz has no alibi for 6-7 hours out of the day Vitale was murdered. In contrast, the prosecution had to claim Dyleski murdered Vitale within an extremely small window of time. The time for Dyleski to commit the crime is before 9:30 am, but even if you want to claim Dyleski wasn't home until 10:30 am, he had far less opportunity to murder Vitale than Daniel Horowitz did or some other perpetrator could have had. In his initial police interview, Horowitz claimed he woke up about 7 am, saying two alarm clocks went off around 6:45 am. When his computer was examined it was started up around 6:10 am that morning and that he logged off after Vitale's computer was powered on (although forensics show her computer clock could not be accessed because it was password protected). Horowitz ends up claiming Vitale was asleep when he left home at 7 am. Horowitz claims he connected with Robert Massi via phone around 8:10 am, once claiming he had stopped at Safeway before that. Their meeting was scheduled for 8:30 am. The media reported that Horowitz claimed he was at Millie's between 8-10 am (Oct 20, 2005, SF Chronicle) . His final claim is that he was at Millies Diner with Massi from 8:15 - 9 am, not enough time really to wait in line for a seat, order breakfast and eat given how busy the diner is on the weekends. He claims he called Vitale around 9 am when he was leaving the meeting with Massi (supposedly just a few minutes before Vitale sent an email). HOROWITZ: When she didn`t pick up the phone during the day when I call her, because I always would call her. I just had this funny feeling, and maybe even a little bit, Nancy, that morning (aired Oct 19, 2005, CNN). But, no calls were made to or from Vitale's cell phone that day. If Horowitz called her it seems it would have to have been on their land line - their home phone. In an interview with Fernando Solis who had worked on the property and was related to Vitale's maid, he says Vitale never answered the house phone, only her cell. Horowitz claimed to call Vitale two or three times the day she was murdered, never getting her on the phone. After leaving Millie's at 9 am, Horowitz claims he drove to his office in Oakland. No one appears to have seen him until an 11 am meeting with the Polk legal team that lasted until 2-2:30 pm. From 2-2:30 pm - after 5:30 pm, when he claims he purchased groceries at the Lafayette Safeway, there is no evidence Horowitz has any alibi. Scott Dyleski submitted a declaration in the Dec 2011 petition where he directly states, "I did not kill Pamela Vitale." For those who claim Dyleski never denied that or did not show remorse, perhaps this puts their thoughts to rest as he has and does claim his innocence. "While Ms. Leonida was my trial counsel, she informed me that no evidence or interview existed that implicated Daniel Horowitz in the murder of his wife, Pamela Vitale, besides the Declaration of Susan Polk. " And, "Ms. Leonida further stated that investigating Mr. Horowitz and presenting him as a suspect would not be wise because of his notoriety." Scott Dyleski also puts to rest the story about meeting a woman in a car that morning, declaring that he made it up. Dyleski's current attorneys have already included several interviews that were not even transcribed and evidence that not only points toward Daniel Horowitz, but also to other possible suspects. Since when should a valid suspect not be investigated because of their notoriety?? This also raises a huge red flag as to why Scott Dyleski was not appointed a guardian at litem. His trial counsel, Ellen Leonida, did not call even one single expert witness to dispute any evidence or testimony. "The verdict was guilt on all counts, which just means that the president of Ukraine, (Leonid) Kuchma reached its ugly hands in our court system, held back evidence that would have acquitted Lazarenko. Right now in Kiev in his office, there are papers that show that Pavlo Lazarenko is innocent. And Kuchma is going to get his due, because we have the Melnichenko tapes (tapes apparently recorded by Kuchma's body guard and which appear to implicate him in a number of criminal acts) where he is ordering the murderings, we have got evidence on him that we are going to release (Daniel Horowitz, Lazarenko's lawyer:)." "Pavlo Lazarenko is being charged first and foremost with violating Ukrainian law. The head of the Ukraine Supreme Court and the former head of the prosecutor's office of Ukraine both said he didn't violate Ukraine law. So somehow, an American jury has found that he violated American law, when the leaders of Ukraine say that he hasn't. The only person who takes the opposite view in Ukraine is Kuchma, a man who is one of the largest international mafioso, who has a stranglehold on his country, that's our opponent (Daniel Horowitz, Lazarenko's lawyer:)." While there were huge problems between the main builder, Rick Ortiz, and Vitale/Horowitz, he was never interviewed by police, the prosecutor, or the defense until the Spring of 2011 when he came forward. There was a plethora of construction crews and, hence workers at the site, yet there was very little testimony regarding who was or wasn't there for the past few months. There was a lawsuit pending for fraud against one contractor at the time and several lawsuits against contractors filed after Vitale was murdered. In a 2011 declaration, Ortiz outlines severe problems with the mansion construction and said he was threatened by Daniel Horowitz who showed him a picture of his wife and children who were living in another state at the time. He states that Horowitz said his family (Horowitz's) were very upset with the financial problems related to the mansion construction, that it was either Ortiz or Vitale who would have to pay. Official records show that Vitale and Horowitz ending up owning the Ortiz's vacation property in Red Bluff, Tehama County, California worth around $300, 000. 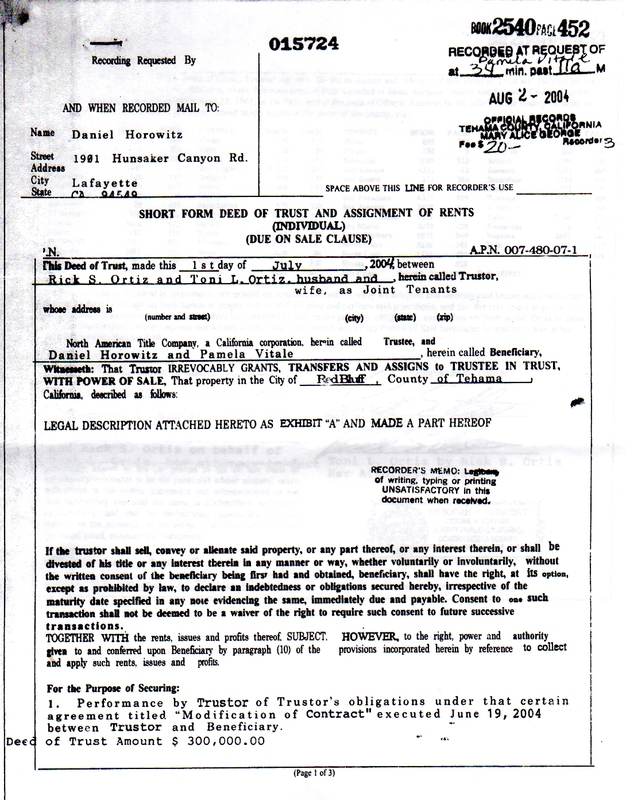 Ortiz has said the actual Deed of Trust document was doctored before it was submitted to the Clerk to almost double the amount agreed upon and that this document was only initially intended to secure his work until he was finished on the mansion in Dec of 2004. Ortiz and his wife owned the property outright. Horowitz and Vitale also owned Joe Lynch's property, acquired about a year before the murder and purchased at a far lower price than the property's worth. Yet Daniel Horowitz immediately claimed in the media after the murder that his wife had no assets other than a small retirement fund. Vitale's sister, Tamara Hill, stated that during the week before the murder, Vitale was afraid of telling Daniel Horowitz that wood flooring purchased three years prior for the mansion and stored in its basement had been ruined due to a leak in the roof and would have to be replaced. Wood flooring has to be stored carefully in order not to warp it, let alone directly incur water or high moisture damage. Daniel Horowitz claimed after Dyleski's May 2011 petition that no flooring had been ruined, however, he has filed multimillion dollar lawsuits against several contractors since Vitale died, including the roofing contractor. It's me, Pamela Vitale! I know, I know ... we haven't talked in so long. Believe it or not, I am STILL building our house!!!!!!!! We had quit a bit of bad luck. Our original builder ABANDONED the project when it was just 60% done (he told us it was 85% done). He stole a bunch of our money, left the state, the rains began up here, we had EXTENSIVE water damage throughout the house, and when we contacted his insurance company to inform them we would be submitting a claim, we found out the he had given us a FORGED insurance certificate!!!!!! It was a disaster .....materially, emotionally, and financially. Luckily, a friend of a friend came out of retirement to help us out and take over the project. It took 6 1/2 months just to repair the house and get it back to a state that we could continue moving forward on the building of it. THAT is why you have not heard from me. Sorry. 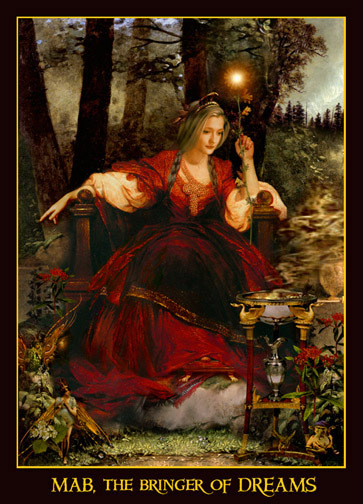 I'm still incredibly busy and overwhelmed, but just wanted to get this message to you to let you know that I think of you and look forward to the time when things have settled done (sic) and I can properly communicate on a regular basis. WE should be moving in around Xmas. How are you? Any new research? Best Regards from your old Darge relative. In nearly every public account of Horowitz and Vitale's marriage, they were incredibly happy. However, several accounts claim otherwise. Daniel Horowitz flirted with Susan Polk and a potential juror in her trial, Valerie Northrup, who was excused. (Susan Polk Declaration). The second claim appears to be validated by authors of books about Susan Polk and from court watchers during her trial in 2005. 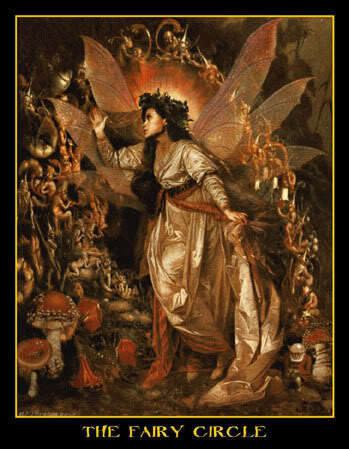 Richard Sellers reported (before 10/19/2005) that Pamela Vitale looked at their tile work to consider their contractor. She arrived, driving a gray Mercedes with an unidentified man she introduced as her husband who was 6'3/4", about 55 years old with a lean build, attractive, salt and pepper hair, appearing affluent, wearing khaki pants and a black Hawaiian print shirt. ~ Mid May- Mid June, 2005. Tamara Hill, Pamela's sister, claimed Daniel Horowitz questioned her about Pamela meeting with or having dinner with her ex boyfriend within a day or two after the murder and that Daniel Horowitz said of Pamela, "She hurt me". (Tamara Hill Police interview Oct 17th, 2005). Tamara and her husband Phil also specifically contacted police to look at Horowitz as a suspect and to look at domestic violence between the two. The maid reported that Vitale had a black eye that was still very very bad a week after it had happened. Vitale had claimed it was an accident. It's likely it was the same time period that Vitale told her sister she had broken her glasses in an accident that resulted in an emergency room visit - a few months before her murder. The maid also reported another strange incident where Vitale ran into the bedroom and pulled out a large wad of money when a strange man arrived at the trailer door one day. That money was taken from the bedroom (Araceli Solis Police Interview, 2005). Several different people have already claimed that Daniel Horowitz flew into rages, threatened them, or relayed how others (prisoners, bikers, family mob members) could or would exact revenge. 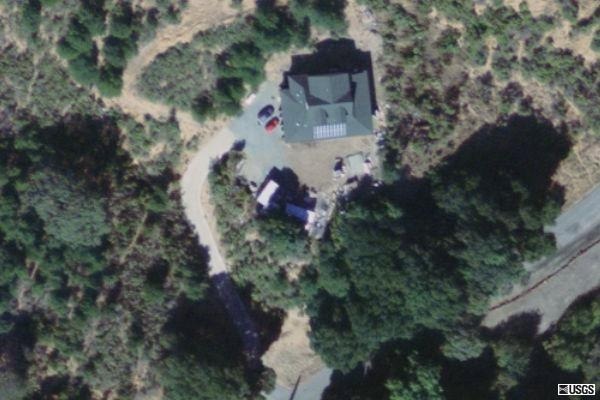 The media presented the household where Scott lived as "a crowded, unkempt straw-bale house on Hunsaker Canyon (Contra Costa Times, 10/20/2005)" while the condition of the Vitale/Horowitz trailer was presented as somewhat cluttered in court and not covered by the media much. 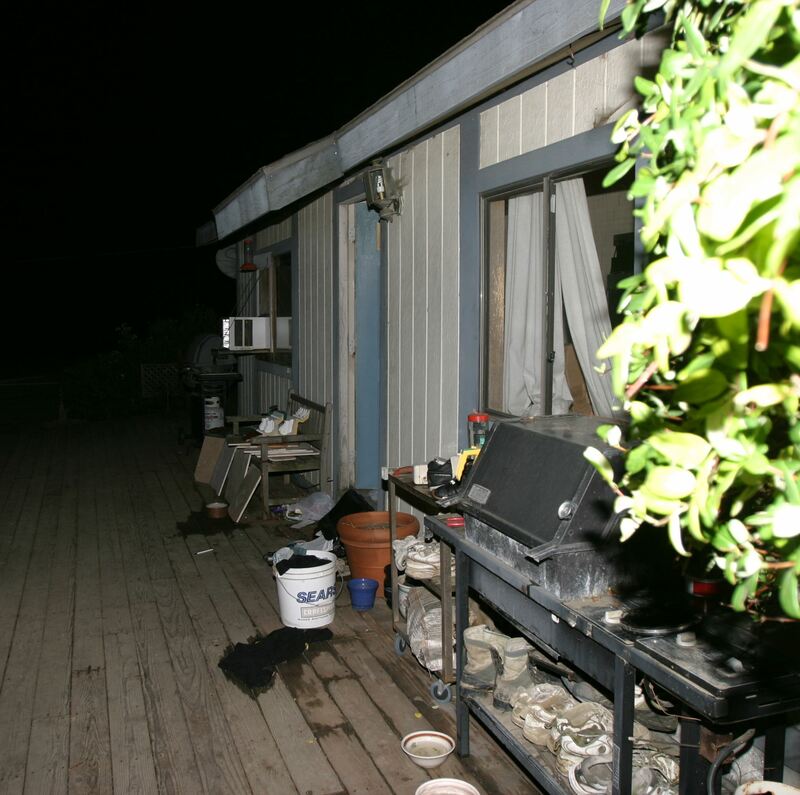 The trailer they were living in was however a fire trap, the back door completely blocked and some rooms and areas crammed with piles of stuff several feet high piles. The kitchen table and the small dining area was completely covered and inaccessible. The trailer exterior was in poor condition showing a lot of damage to the siding. The hot water in the kitchen was not working with dirty dishes in both sinks and in the dishwasher. Curtains in the living room were in disarray and partially pulled onto the couch in front of the main window. There were various and numerous boxes, files, and papers strewn all over the living room and in f ront of the living room bookcase as well as there were construction samples lying everywhere. There were many empty wine bottles throughout the house and open whiskey and bourbon bottles right by the bed in the master bedroom. Even though the living space was already very small, the pantry, shelves, and refrigerator were stuffed full of multiples of the same items. In the pantry canned foods and beverages overflowed into a large heap blocking pantry shelves. "Detectives L. Santiago, Pate, and I entered the two bedrooms located at the north end of the residence ... packed almost floor to ceiling with boxes, items of clothing, and other articles (Exhibit O, Barnes Report)." Shortly before Scott Dyleski was arrested, the crime scene where Pamela Vitale was brutally murdered was released back to Daniel Horowitz and Nancy Grace gave a tour of the property that included the 'Mansion' - it was still under construction, but nearly completed at that point. Grace: Why did they make this a crime scene? Horowitz: Because they want prints of the people that worked here at the house (construction workers). The 'Mansion' construction was completed the day Daniel Horowitz testified in Scott Dyleski's trail and that property as well as adjoining property, once belonging to Joe Lynch, are for sale (virtual tour). There are an untold number of problems with this case, many of these will not be fully known until there is further investigation. As an example, Dyleski's attorney not only called zero experts to challenge evidence (except for one expert on YSTR DNA), she often did not ask pertinent questions of the prosecutions' witnesses. Jewett: ... are they made available for anyone associated with the case who wants to have them examined and tested ? Philip Venable arrived at the crime scene about midnight the night of Vitale's murder to take computers into custody. He describes how he had not entered the crime scene (trailer) yet because Taflya was still processing it and affirms in testimony to Hal Jewett that the interior of the trailer was not well lit while it was being processed. You would think processing such a complicated crime scene of a horrific murder would warrant some flood lights, bright lights, extra lights, or something?